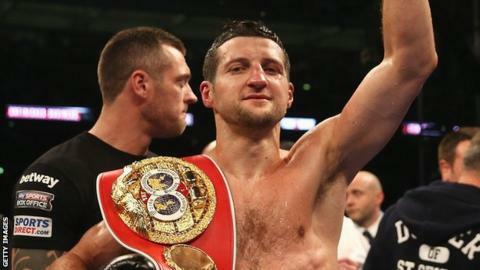 Britain's Carl Froch would regret retiring from boxing without fighting in Las Vegas, according to his fellow former world champion Ricky Hatton. Froch, who was stripped of his WBA super-middleweight belt, is expected to announce his future plans this week. The 37-year-old was due to fight Julio Cesar Chavez Jr in Las Vegas in March but injured his elbow in training. "The greatest achievement for a British boxer is to see their name up in lights in Vegas," Hatton told BBC Sport. "Despite everything Carl's achieved, it will eat away at him after he's retired if he doesn't have a Vegas fight on his CV. "He's won a couple of world titles, been in some big events and fought the best names in the division. But he hasn't fought in Vegas." Hatton, a former two-weight world champion, boxed in the fight capital of the world on five occasions. The city means so much to him he has released a book focusing on his Las Vegas exploits. Hatton, 36, won three of his fights there but was beaten by Floyd Mayweather and Manny Pacquiao, who engaged in the most lucrative bout in history earlier this month. Nottingham's Froch has fought in the United States four times, including victories over Jermain Taylor and Glen Johnson and a defeat by Andre Ward, but his biggest moments came in Britain. Last summer he knocked out domestic rival George Groves in front of 80,000 people at Wembley Stadium, but he is now without a world title having relinquished his IBF belt prior to being stripped of his WBA crown. Froch, who has 33 wins from 35 pro fights, recently ruled out a meeting with Britain's former Olympic champion James DeGale, who fights Andre Dirrell for the vacant IBF title in Boston on Saturday. "The fact he hasn't got any titles might persuade him to retire," added Hatton, who quit for a second time in 2012 following a comeback defeat by Vyacheslav Senchenko. "They want to see Americans fighting Americans over there and if Carl's not fighting for a world title and he's not fighting a big name, it makes it difficult for him." Hatton believes Froch deserves to be ranked alongside Britain's super-middleweight greats of the past, including Nigel Benn, Chris Eubank and Joe Calzaghe. "Carl has fought some decent opponents and deserves to be in the same company as those fighters," said Hatton. "But he wasn't as big a name as Benn and Eubank, because they made each other. And Carl just wasn't in a great era." Calzaghe and Froch both beat Mikkel Kessler, but Froch needed a rematch to do so, six years after Calzaghe's triumph. Hatton said: "Calzaghe had wins over a prime Kessler, Jeff Lacy and Roy Jones, but I just don't see anything like that on Carl's record. "Calzaghe would certainly have been too hot for Carl. Calzaghe was the best of the crop - very, very special."